The primary cilium is fundamentally important in neural progenitor cell proliferation, neuronal differentiation, and adult neuronal function. Here, we describe a method to study ciliogenesis and the trafficking of signaling proteins to cilia in neural stem/progenitor cells and differentiated neurons using primary neurosphere cultures. Shimada, I. S., Badgandi, H., Somatilaka, B. N., Mukhopadhyay, S. Using Primary Neurosphere Cultures to Study Primary Cilia. J. Vis. Exp. (122), e55315, doi:10.3791/55315 (2017). The primary cilium is fundamentally important for the proliferation of neural stem/progenitor cells and for neuronal differentiation during embryonic, postnatal, and adult life. In addition, most differentiated neurons possess primary cilia that house signaling receptors, such as G-protein-coupled receptors, and signaling molecules, such as adenylyl cyclases. The primary cilium determines the activity of multiple developmental pathways, including the sonic hedgehog pathway during embryonic neuronal development, and also functions in promoting compartmentalized subcellular signaling during adult neuronal function. Unsurprisingly, defects in primary cilium biogenesis and function have been linked to developmental anomalies of the brain, central obesity, and learning and memory deficits. Thus, it is imperative to study primary cilium biogenesis and ciliary trafficking in the context of neural stem/progenitor cells and differentiated neurons. However, culturing methods for primary neurons require considerable expertise and are not amenable to freeze-thaw cycles. In this protocol, we discuss culturing methods for mixed populations of neural stem/progenitor cells using primary neurospheres. The neurosphere-based culturing methods provide the combined benefits of studying primary neural stem/progenitor cells: amenability to multiple passages and freeze-thaw cycles, differentiation potential into neurons/glia, and transfectability. Importantly, we determined that neurosphere-derived neural stem/progenitor cells and differentiated neurons are ciliated in culture and localize signaling molecules relevant to ciliary function in these compartments. Utilizing these cultures, we further describe methods to study ciliogenesis and ciliary trafficking in neural stem/progenitor cells and differentiated neurons. These neurosphere-based methods allow us to study cilia-regulated cellular pathways, including G-protein-coupled receptor and sonic hedgehog signaling, in the context of neural stem/progenitor cells and differentiated neurons. The primary cilium is a microtubule-based dynamic subcellular compartment that functions as a sensory antenna in coordinating cellular signaling pathways, including the Sonic Hedgehog (Shh) pathway during embryonic neuronal development1,2, and compartmentalized subcellular signaling in adult neuronal function3,4. Signaling components of these pathways, such as the Shh receptor Patched5; the pathway activator Smoothened (Smo)6; and Gpr1617, an orphan G Protein-coupled Receptor (GPCR) that negatively regulates the Shh pathway, localize to cilia in a dynamic fashion. Multiple GPCRs have been reported to localize to the cilia in neurons in the brain7,8,9,10,11,12,13,14,15,16. Defects in cilia and cilia-generated signaling pathways affect multiple tissues and are collectively known as ciliopathies17,18,19. The ciliopathy disease spectrum frequently includes neurodevelopmental defects, such as craniofacial abnormalities20,21,22. In addition, primary cilia in hypothalamic neurons regulate central satiety pathways, and defects result in central obesity23, mirroring obesity in syndromic ciliopathies such as Bardet Biedel syndrome24. In addition, neuropeptide receptor signaling in cilia regulates central satiety pathways11,14. Ciliary localization of Adenylyl Cyclase III (ACIII) and GPCRs such as somatostatin receptor 3 in hippocampal neurons result in novel object recognition defects and memory deficits25,26 and parallels a lack of ciliary integrity27. The developmental aspects of cilia-generated signaling are closely tied to tissue homeostasis; in particular, cilia are important to the progression of Shh-subtype medulloblastomas arising from granule progenitors in the cerebellum28,29. Thus, primary cilia play important roles during embryonic, postnatal, and adult neuronal development and function. Neural Stem Cells (NSCs) reside in the subventricular zone (SVZ) of the lateral ventricle, the subgranular zone of the dentate gyrus of the hippocampus, and the ventricular zone of the third ventricle in the hypothalamus in mammals30,31,32. NSCs are multipotent, possess the capacity for self-renewal, and are important for brain development and regenerative medicine30. Most NSCs in the SVZ are quiescent and possess a solitary primary cilium that, in many cases, extends out to the lateral ventricle33. The primary cilium signals via the localization of various receptors, inducing downstream cellular responses, particularly in relation to Shh, TGFβ, and receptor tyrosine kinase pathways2,34,35,36. Since primary cilia extend into the lateral ventricle, it is hypothesized that primary cilia detect cytokines in the cerebrospinal fluid (CSF) to activate NSCs37. Recent studies suggest that the Shh signaling pathway and primary cilia are critical for the activation of stem cells in the repair and regeneration of multiple tissues, including the olfactory epithelium, lung, and kidney38,39,40,41. However, the mechanisms by which CSF communicates with NSCs and whether primary cilia are involved are not known. Adherent NSCs in culture are ciliated; localize Shh pathway components, such as Smo and Gpr161 in cilia; and are Shh responsive42. Thus, NSCs can serve as an important model system to study the Shh pathway, ciliary trafficking, and neuronal differentiation pathways. 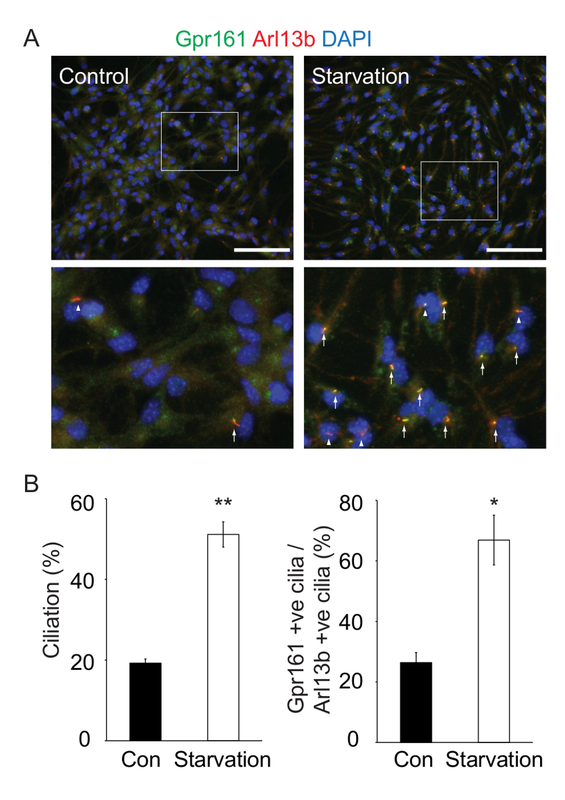 In addition, neurons differentiated from NSCs can also be used for ciliary trafficking assays. Neurospheres are constituted of clusters of free-floating cells arising from the proliferation of neural stem/progenitor cells that grow in the presence of specific growth factors and nonadhesive surfaces43,44. Neurospheres serve as important in vitro culture models to study neural stem/progenitor cells in normal development and disease31,45,46,47. Here, we describe a neurosphere-based assay for culturing neural stem/progenitor cells and for differentiation into neurons/glia. We particularly emphasize the trafficking of signaling components to cilia of neural stem/progenitor cells and differentiated neurons (Figure 1). As opposed to culturing primary neurons, primary neurospheres are relatively easy to culture, are amenable to multiple passages and freeze-thaw cycles, and can undergo differentiation into neurons/glia. Importantly, we determined that neurosphere-derived neural stem/progenitor cells and differentiated neurons are ciliated in culture and localize signaling molecules relevant to ciliary function in these compartments. 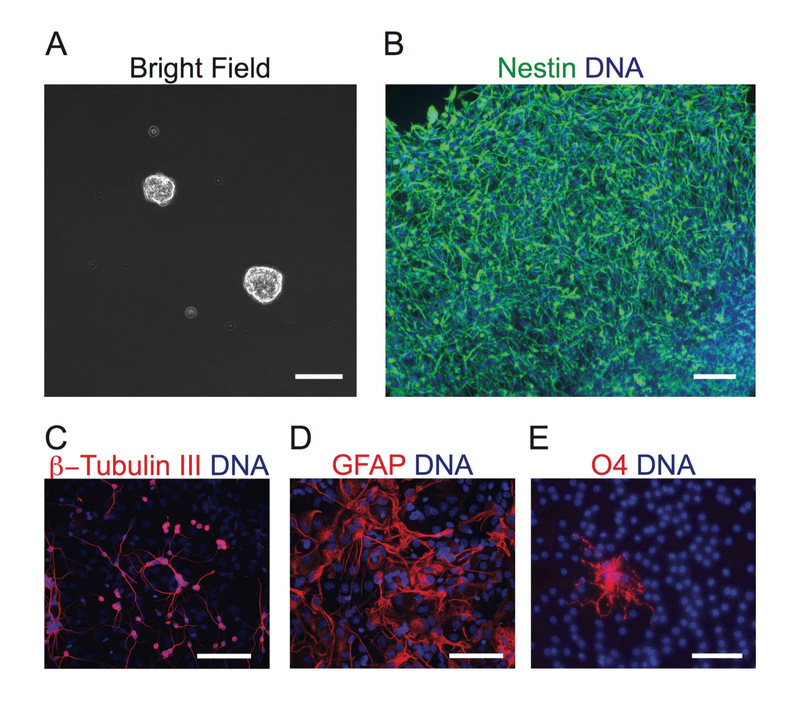 Neurosphere-based culturing methods can serve as an ideal model system for studying ciliogenesis and ciliary trafficking in NSCs and differentiated neurons. Euthanize an adult mouse (around 2 months old) by an overdose of isoflurane. Double-check that the mouse has stopped breathing and dissect immediately after death. Using scissors, make a midline incision to open the skull. Remove the brain. Place the brain in cold PBS in a 10 cm dish on ice. Follow the whole-mount dissection method to obtain the SVZ from the lateral ventricle48. Place the lateral ventricle into a 1.5 mL tube, add 500 µL of 0.05% trypsin-EDTA in PBS, and incubate the tube for 15 min at 37 °C in a water bath. After 15 min, add 500 µL of stopping medium and gently pipet 20 - 30 times with a 1 mL tip. Avoid forming air bubbles during pipetting. NOTE: This step is critical for cell survival. Spin down the cells at 500 x g for 8 min. Discard the supernatant, add 1 mL of PBS, and resuspend the cells by gently pipetting 5x with a 1 mL tip. Spin down at 500 x g for 8 min. Discard the supernatant using a 1 mL tip and add 1 mL of basal medium. 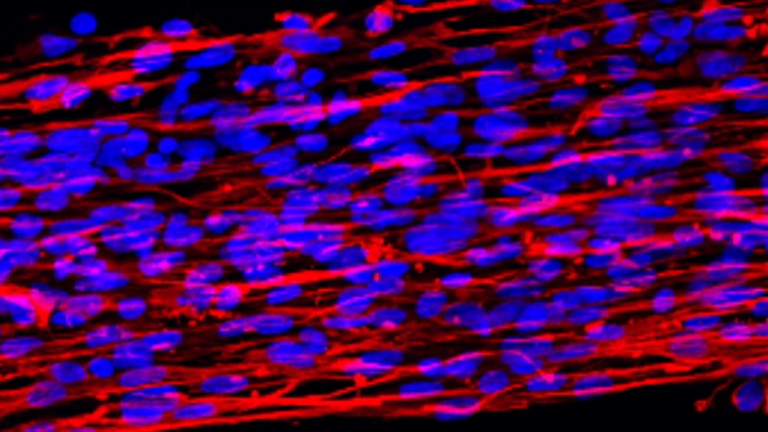 (Optional) If cellular debris are observed, pass the cells through a 70 µm cell-strainer. Count the number of cells with a hemocytometer; in general, about 30,000 - 60,000 cells/SVZ are obtained. Plate the cells from one SVZ into a 10 cm dish with 10 mL of NSC medium and culture at 37 °C with 5% CO2. (Optional) To avoid fusion between spheres49, put 1,000 cells in a single well of an ultra-low-binding 6-well plate that is prefilled with 1.5 mL of NSC medium and culture at 37 °C with 5% CO2. NOTE: After 5-7 days, neurospheres can be observed (Figure 2A). The culturing period may differ with the age of mouse or the genetic background. Add 2 mL of NSC medium every 3-4 days to maintain the culture (do not remove the existing medium). To analyze the differentiation capacity, analyze the neurospheres under adherent conditions in differentiation medium. Sterilize 12 mm round coverslips by autoclaving or with UV exposure prior to use. For an adherent cell culture, put a sterilized 12 mm round cover glass into a well of a 24-well plate under aseptic conditions. Coat the cover glass for 10 s with 500 µL of 0.002% poly-L-Lysine (PLL). Aspirate the solution and dry it for 10-15 min. Add 500 µL of laminin solution (5 µg/µL). Incubate the cover glass for 1 h at 37 °C. Aspirate the laminin and add 500 µL of differentiation medium or NSC medium (undifferentiated control). For the differentiation assay, pick up a 100 - 200 µm sphere with a 200 µL tip under the microscope. Add 5-10 neurospheres to each well of a 24-well plate and culture for 7-10 days in differentiation medium. To analyze undifferentiated neurospheres, add 5-10 neurospheres to each well of a 24-well plate and culture for 1-2 days in NSC medium. Attached neurospheres spread and grow as a monolayer (Figure 2B). After carefully removing the medium, fix the cells with 4% paraformaldehyde (PFA) in PBS for 15 min at RT, and then wash with PBS twice for 5 min at RT. The plate can be stored at 4 °C for 1-2 months. NOTE: To visualize neural stem/progenitor cells in NSC medium and differentiated cells in differentiation medium, perform immunostaining against Nestin (neural stem/progenitor cell marker), β–tubulin III (TUJ1 monoclonal, neuronal marker), GFAP (Glial Fibrillary Acidic Protein, astrocyte marker), and O4 (oligodendrocyte marker) (Figure 2B-E). To analyze the cilia, perform immunostaining against Arl13b (primary cilia marker) and Gpr161 (ciliary GPCR) (Figure 3). Mount the cover glass with mounting solution onto a slide glass. Tilt the slide glass to remove excess solution. To analyze cells in intact neurospheres by immunostaining, transfer 1 mL of culturing medium containing multiple neurospheres to a 1.5 mL tube and spin down at 500 x g for 8 min. Fix the spheres with 4% (PFA) after removing the medium for 15 min and wash with PBS. Spin down spheres at 500 x g for 8 min, remove supernatant, and incubate the spheres O/N with 30% sucrose at 4°C. Discard the supernatant using a 1 mL tip and add 500 µL of OCT solution using a cut 1 mL tip. Cut the edge of the tip to widen the opening, as OCT is viscous. Transfer the OCT solution containing the neurospheres into a disposable plastic freezing mold (10 mm x 10 mm x 5 mm). Freeze the mold on dry ice for at least 15 min. (Optional) Stop the experiment and store the mold in a -80 °C freezer for up to 1 year. Cut the sections with a cryostat; the thickness of sections should be 15-30 µm. 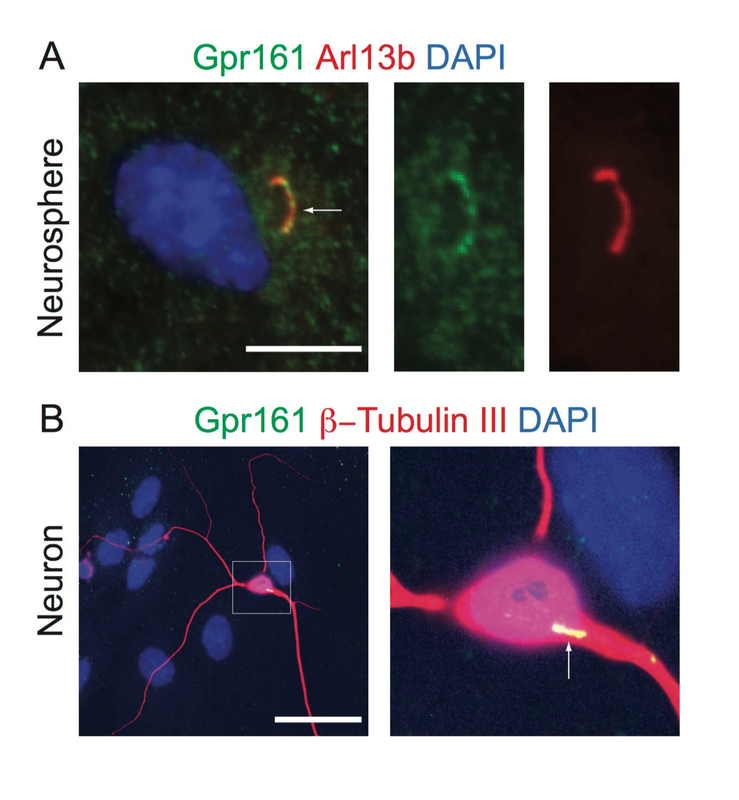 To visualize the primary cilia in a neurosphere, perform immunostaining against Arl13b (Figure 4). Passage the neurospheres while the sphere size is between 100-200 µm; when the neurospheres are too big (300 µm or above), they are not ideal for experiments. Transfer the neurospheres into a 50 mL tube using a 1 mL tip and spin down at 500 x g for 8 min. Discard the supernatant using an aspirator, add 500 µL of 0.05% trypsin-EDTA in PBS, and incubate for 5 min at 37 °C. The amount of trypsin varies depending on the number of spheres. Add 500 µL of serum medium and gently pipet 20 times with a 1 mL tip. (Optional) If cellular debris or undissociated neurospheres are seen, pass the cells through a 70 µm cell-strainer. Passage the cells in a 10 cm dish at a density of 10,000 cells/cm2 in NSC medium; the cells will be ready for the next passage after a week. (Optional) To freeze the cells, add freezing medium to generate 500,000 to 1,000,000 cells/mL suspension. Freeze the cells using cryo-freezing containers; undissociated neurospheres can also be frozen. For the adherent culture, dillute the cells to 50,000 cells/cm2 onto PLL- and Laminin-coated coverslips with NSC medium, and culture for 1-2 days. Prepare starvation medium (Table 1). 1-2 days after the initial plating of adherent cells after dissociation, change to NSC medium in one well (control) and starvation medium in another well (experiment). Culture the adherent cells for 24 h.
Fix the cells with 4% PFA in PBS for 15 min at RT and wash twice with PBS for 5 min each at RT. (Optional) Stop the experiment and store the 24-well plates with coverslips in PBS at 4 °C for 1-2 months. Perform an immunofluorescence protocol for staining7,50. Mount the coverslips using mounting solution. Dry the slide glass O/N at RT in the dark. Acquire images on a compound microscope at the necessary magnification. Use a microscope, a camera, and objectives (40X/1.3 oil and 63X/1.4 oil), controlled using the accompanied software. Take sufficient z-sections at 0.5-0.8 µm intervals (Figure 5). For the quantitative analysis of ciliary localization in adherent cells, acquire stacks of images from 3-8 consecutive fields with confluent cells by looking into the DAPI channel. Quantify the number of primary cilia using ImageJ/Fiji. Typically, use the "Cell counter" tool in the ImageJ Plugins>Analyze dialog box to count the cells with GPCR-positive cilia; maximal projections from stacks of images can also be exported from ImageJ/Fiji.Use similar image intensity and contrast parameters for all images from the same experiment for counting and exporting purposes. Adhere dissociated cells to coverslips for 24 h. Use a cell density typically between 75,000 and 150,000 cells in 500 µL of NSC medium in a single well of a 24-well plate. Mix 25 µL of reduced serum medium and 1.5 µL of transfection reagent in a 0.5 mL microtube by vortexing for 5 s.
Add 2.5 µg of endotoxin-free plasmid DNA to a separate 0.5 mL microtube containing 25 µL of reduced serum media and mix by vortexing for 5 s.
Add 1 µL of transfection reagent to the second microtube containing DNA and mix by vortexing for 5 s.
Add the mixture from the DNA-containing tube to the first microtube and mix by pipetting. Incubate the mixture for 10-15 min at RT. After incubation, gently add the transfection mix dropwise to the wells on top of the NSC medium (500 µL/well). Change the medium 24 h post-transfection to control medium (NSC medium) or starvation medium (500 µL/well). Fix the cells by changing the medium to 4% PFA after 24 h and perform immunostaining; typically, up to a 10% transfection efficiency is obtained using this protocol. After plating the cells from the SVZ in NSC medium for a week, floating neurospheres were observed (Figure 2A). The sizes of the spheres varied between 50 and 200 µm. To examine if the spheres were derived from neural stem/progenitor cells, the neurospheres were plated onto PLL- and Laminin-coated coverslips in NSC medium for 2 days. They were then immunostained against the neural stem/progenitor cell marker, Nestin. Two days were needed to allow the spheres to attach to the coverslips and to grow as a monolayer of cells. The monolayer of cells was positive for Nestin (Figure 2B). To examine the differentiation capacity of the neurospheres, we plated them following steps outlined in section 2 onto PLL- and Laminin-coated coverslips in differentiation medium without dissociation for 7-10 days. It takes at least a week for differentiation. The neurospheres attached to the coverslips and expanded to grow as a monolayer of cells. We fixed the cells and immunostained against neuron, astrocyte, and oligodendrocyte markers. We observed adherent neurospheres that differentiated into β-Tubulin III-positive neurons, GFAP-positive astrocytes, and O4-positive oligodendrocytes (Figure 2C-E). Thus, multipotent neurospheres can be derived from adult mouse SVZ. 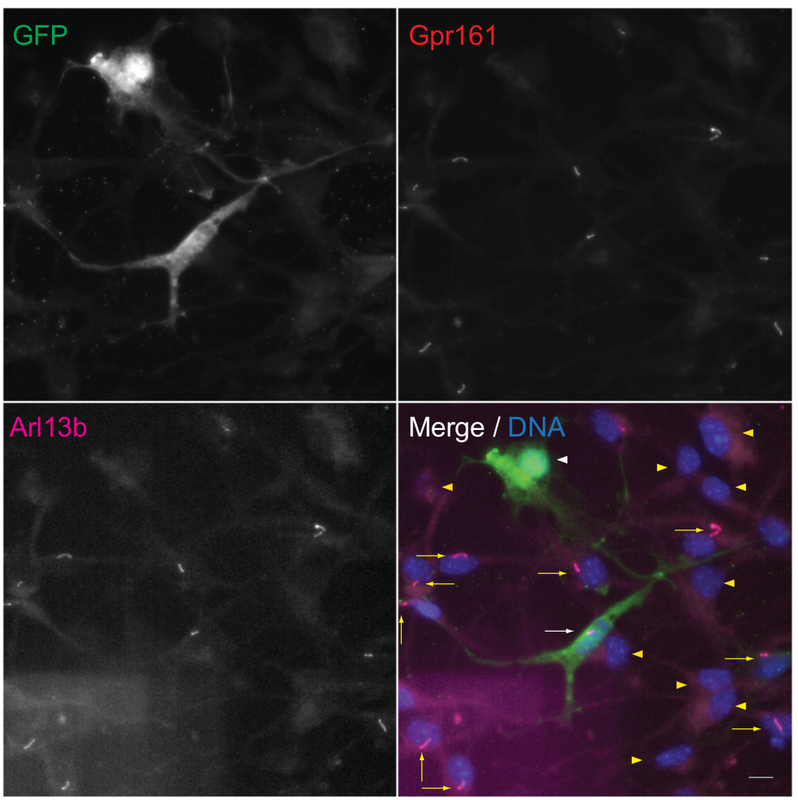 To determine if adherent neurospheres and differentiated neurons have primary cilia, we immunostained against Arl13b (primary cilium marker)51 and Gpr161 (ciliary-localized GPCR)7. In our experience, in available mouse models expressing ARL13B-mCherry, and in studies with developing mouse cortex, most (if not all) neuronal cilia in the brain express Arl13b, while all neurons are not ACIII-positive52,53,54. Thus, we mainly rely on Arl13b to detect neuronal cilia. We detected primary cilia and the localization of Gpr161 to the cilia of progenitor cells in adhered neurospheres (Figure 3A) and in differentiated neurons (Figure 3B). Thus, adherent neurospheres and differentiated lineages are ciliated in culture and localize signaling molecules. To determine if floating neurospheres have primary cilia, we cryosectioned floating neurospheres after fixation, as outlined in section 3. We observed primary cilia in neural stem/progenitor cells in the sectioned neurospheres (Figure 4A-B). It is important to acquire z-sections across the neurospheres to fully visualize primary cilia, because it is difficult to examine the primary cilia in a single z-plane. In summary, undifferentiated neurospheres have heterogeneous populations of ciliated and non-ciliated cells. To analyze the ciliogenesis of neural stem/progenitor cells, we dissociated neurospheres and plated the cells onto PLL- and Laminin-coated coverslips. After culturing them in starvation medium, we observed an increased percentage of cilia, as detected by Arl13b, as compared to those cultured in NSC medium (% ciliation) (Figure 5A-B). In addition, we noted an increased number of Gpr161-positive cilia upon starvation (% Gpr161-positive cilia/Arl13b-positive cilia) (Figure 5A-B). 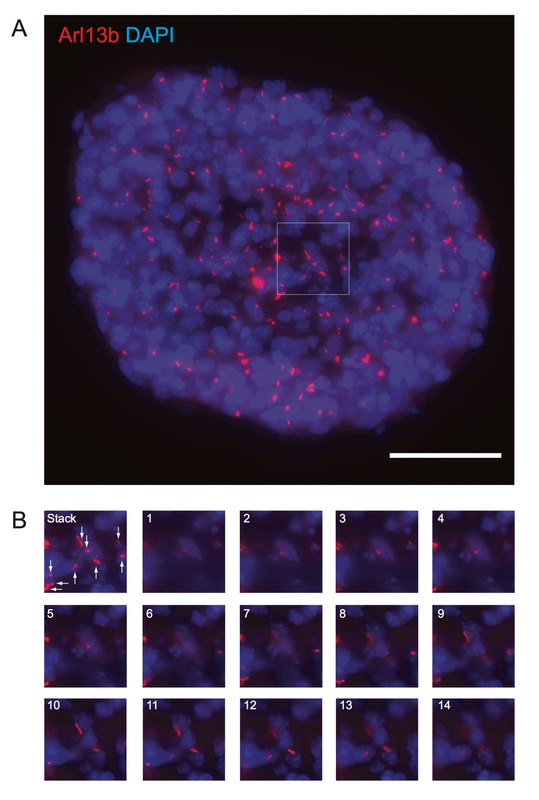 Interestingly, a previous study using undifferentiated human embryonic stem cell lines demonstrated that human embryonic stem cells in culture also possess primary cilia55. The number and length of cilia increase upon serum starvation in these cell lines, and these cilia also possess components of the Shh machinery. We also transfected adherent neural stem/progenitor cells, as outlined in section 6. We typically detected a transfection efficiency of up to 10%, similar to primary neuron cultures in the lab (Figure 6). Store in sterile microtubes in -20 °C or lower. Use a single 80 μL aliquot or 2 μg/100 mL NSC media. Store as sterile microtubes in -20 °C or lower. Use a single 80 μg aliquot/100 mL media. Table 1: Recipe of Solutions. 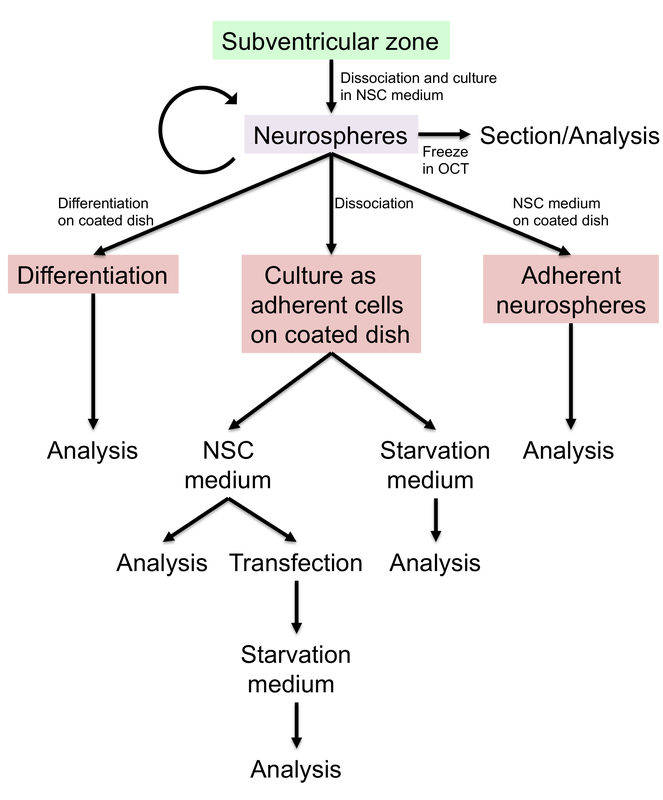 Figure 1: Schematic Diagram of Neurosphere Culture and Differentiation Protocols. Please click here to view a larger version of this figure. Figure 2: Neurospheres Exhibit Differentiation Capacity. (A) Representative neurospheres are shown. (B) Neurospheres were plated onto PLL- and Laminin-coated coverslips in NSC medium for 2 days and were immunostained against Nestin (neural stem/progenitor cell marker). (C-E) Neurospheres were plated following the steps outlined in section 2 onto PLL- and Laminin-coated coverslips in differentiation medium for 7 days without dissociation; fixed; and immunostained against β-Tubulin III (neuronal marker), GFAP (astrocyte marker), and O4 (oligodendrocyte marker). The nuclei were stained by DAPI. Scale bar = 100 µm. Please click here to view a larger version of this figure. Figure 3: Neurospheres and Neurons in Adherent Differentiated Neurospheres are Ciliated. (A) Undissociated neurospheres were plated onto coated coverslips in NSC medium for 2 d; fixed; and immunostained against Gpr161 (green), Arl13b (red), and DNA (blue). (B) Differentiated neurons were immunostained against Gpr161 (green), Arl13b (red, A) or β-Tubulin III (red, B), and DNA (blue). White arrows indicate Gpr161 localization in cilia. The right panels in (A) are enlarged views of the primary cilium indicated by the white arrow. The Gpr161-positive cilium in the white-boxed neuron is shown to the right in (B). Scale = 10 µm (A); 50 µm (B). Please click here to view a larger version of this figure. Figure 4: Floating, Undifferentiated Neurospheres Possess Ciliated Cells. Floating neurospheres were fixed, embedded in OCT, cryosectioned, and processed for immunofluorescence against Arl13b (red) and DNA. Arl13b-positive primary cilia in a neurosphere are shown. The panel in (A) is a maximum-intensity projection of 14 z-sections at 0.8 µm intervals from a neurosphere. The panels in (B) show the enlarged view of ciliated cells in the white-boxed region in (A). The maximal projection image from all z-sections is shown as a stack, while numbers 1 to 14 indicate individual z-sections. The white arrows indicate primary cilia. Scale bar = 50 µm. Please click here to view a larger version of this figure. Figure 5: Starvation Induces Ciliogenesis in Dissociated Adherent Neural Stem/Progenitor Cells. (A) Dissociated cells were plated onto coated coverslips in NSC medium or starvation medium for 24 h; fixed; and immunostained against Gpr161 (green), Arl13b (red), and DNA (blue). Gpr161-positive cilia are observed in control (left) and starved (right) cells. The lower panels are enlarged views of the indicated white boxes in the respective upper panels. The white arrows and arrowheads indicate Gpr161-positive and -negative cilia, respectively. Scale bar = 100 µm. (B) Quantification of Arl13b-positive ciliated cells (left graph) and Gpr161 localizing in Arl13b-positive cilia (right graph) in control and starved cells. The percentages of both Arl13b-positive ciliated cells and Gpr161 localizing in Arl13b-positive cilia increased upon starvation. The quantification was performed from two fields of view each from two technical replicates of a single experiment. The data are represented as the mean from all 4 fields of view ±the standard deviation. *, P <0.05; **, P <0.01. Please click here to view a larger version of this figure. 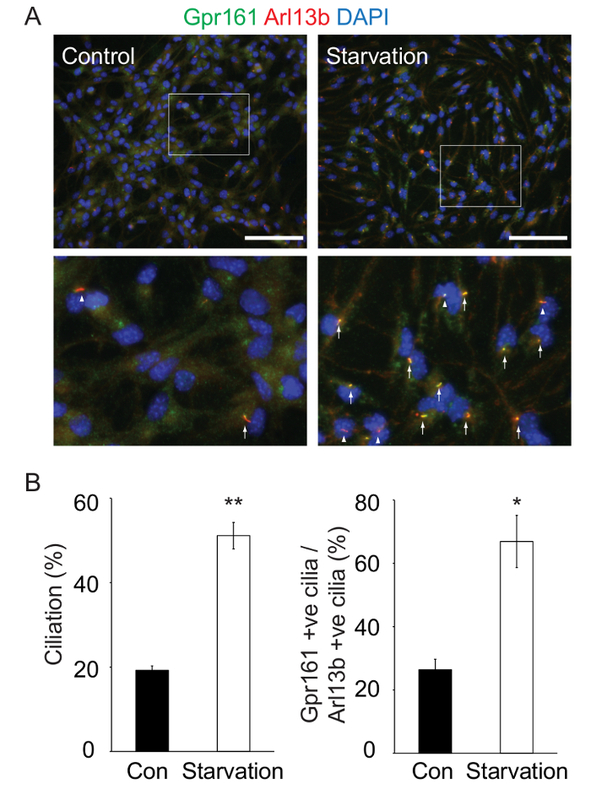 Figure 6: Transfection in Dissociated Adherent Neural Stem/Progenitor Cells. Dissociated cells plated on coated coverslips were transfected with a LAP-TULP3 N-terminus (1-183 aa) mut12 construct that does not bind to the core IFT-A complex56. The medium was changed to starvation medium 24 h post-transfection. The cells were fixed after 24 h and immunostained against GFP (green), Gpr161 (red), Arl13b (magenta), and DNA (blue). A transfected cell with Gpr161- and Arl13b-positive cilium is marked by a white arrow, while a transfected cell without cilia is shown with a white arrowhead. Yellow arrows and arrowheads point to untransfected cells with or without Gpr161/Arl13b, respectively. Scale bar = 10 µm. Please click here to view a larger version of this figure. Here, we describe a method to generate and maintain neurosphere cultures from adult mouse SVZ. A few pertinent points regarding the cultures are as follows. First, the sizes of the spheres are typically between 50 - 200 µm. In our experience, when a neurosphere gets larger than 300 µm in diameter, the optimal time for passaging has been missed. These larger spheres contain dead cells in the core. Second, as neurospheres are commonly used to study neural stem/progenitor cells, it is important to use EGF and FGF-basic (bFGF) to maintain the stemness of these cells. Therefore, factors that induce differentiation, such as FBS, must be avoided during the maintenance of the neurospheres. It has been shown that 10% FBS can differentiate neurospheres into astrocytes47. Third, the degree of neuronal differentiation might depend on the age of mouse. If one desires more neuronal differentiation from neurospheres, younger mice (postnatal day 0) can be used. Fourth, if starting new cultures, it is always good to examine the differentiation capacity of the neurospheres. Fifth, our method also allows freezing and thawing from established neurosphere cultures for future experimental use. After thawing, cells typically grow as adherent spindle-shaped cells without poly-L-lysine or laminin. This may be caused by freeze-thaw damage to the cells. It is important to keep the cells growing until they become 60 - 80% confluent before passage. After the passage, cells typically grow as neurospheres and can generally be passaged up to 5 - 10 times. Neurosphere-based culture methods allow us to study ciliary trafficking and signaling pathways in neural stem/progenitor cells and differentiated neurons. We examined primary cilia in floating/adherent and differentiated neurospheres. It is important to acquire several z-sections to visualize cilia throughout the full extent of the neurospheres. Furthermore, after generating adherent cultures of these neurospheres, and starving them for 24 h, most of the cells are ciliated (Figure 5) and enriched in the orphan GPCR, Gpr161. However, prolonged starvation of the adherent cultures results in subcellular vacuolar structures. Thus, it is important to carefully optimize starvation periods for particular experimental purposes. Currently, studies on ciliogenesis are predominantly performed in a few ciliated, immortalized cell lines57. These cell lines do not always faithfully recapitulate neurons and neural stem/progenitor cells in expressing signaling components, such as GPCRs or Shh pathway machinery, making it imperative to develop newer methods to study the role of cilia in biological processes. The neurosphere-based methods described here allow us to study cilia-regulated cellular pathways, including GPCR and Shh signaling in the context of neural stem/progenitor cells and differentiated neurons. Work in S.M. 's laboratory is funded by recruitment grants from CPRIT (R1220) and NIH (1R01GM113023-01). Mukhopadhyay, S., Rohatgi, R. G-protein-coupled receptors, Hedgehog signaling and primary cilia. Semin Cell Dev Biol. 33, 63-72 (2014). Goetz, S. C., Anderson, K. V. The primary cilium: a signalling centre during vertebrate development. Nat Rev Genet. 11, 331-344 (2010). Guemez-Gamboa, A., Coufal, N. G., Gleeson, J. G. Primary cilia in the developing and mature brain. Neuron. 82, 511-521 (2014). Louvi, A., Grove, E. A. Cilia in the CNS: the quiet organelle claims center stage. Neuron. 69, 1046-1060 (2011). Rohatgi, R., Milenkovic, L., Scott, M. P. Patched1 regulates hedgehog signaling at the primary cilium. Science. 317, 372-376 (2007). Corbit, K. C., et al. Vertebrate Smoothened functions at the primary cilium. Nature. 437, 1018-1021 (2005). Mukhopadhyay, S., et al. The ciliary G-protein-coupled receptor Gpr161 negatively regulates the Sonic hedgehog pathway via cAMP signaling. Cell. 152, 210-223 (2013). Hilgendorf, K. I., Johnson, C. T., Jackson, P. K. The primary cilium as a cellular receiver: organizing ciliary GPCR signaling. Curr Opin Cell Biol. 39, 84-92 (2016). Berbari, N. F., Johnson, A. D., Lewis, J. S., Askwith, C. C., Mykytyn, K. Identification of ciliary localization sequences within the third intracellular loop of G protein-coupled receptors. Mol Biol Cell. 19, 1540-1547 (2008). Berbari, N. F., Lewis, J. S., Bishop, G. A., Askwith, C. C., Mykytyn, K. Bardet-Biedl syndrome proteins are required for the localization of G protein-coupled receptors to primary cilia. Proc Natl Acad Sci USA. 105, 4242-4246 (2008). Loktev, A. V., Jackson, P. K. Neuropeptide Y family receptors traffic via the Bardet-Biedl syndrome pathway to signal in neuronal primary cilia. Cell Rep. 5, 1316-1329 (2013). Marley, A., Choy, R. W., von Zastrow, M. GPR88 reveals a discrete function of primary cilia as selective insulators of GPCR cross-talk. PLoS One. 8, e70857 (2013). Marley, A., von Zastrow, M. DISC1 regulates primary cilia that display specific dopamine receptors. PLoS One. 5, e10902 (2010). Omori, Y., et al. Identification of G Protein-Coupled Receptors (GPCRs) in Primary Cilia and Their Possible Involvement in Body Weight Control. PLoS One. 10, e0128422 (2015). Koemeter-Cox, A. I., et al. Primary cilia enhance kisspeptin receptor signaling on gonadotropin-releasing hormone neurons. Proc Natl Acad Sci USA. 111, 10335-10340 (2014). Brailov, I., et al. Localization of 5-HT(6) receptors at the plasma membrane of neuronal cilia in the rat brain. Brain Res. 872, 271-275 (2000). Hildebrandt, F. .,,T. .,&K. atsanis,N. ., Benzing, T., Katsanis, N. Ciliopathies. N Engl J Med. 364, 1533-1543 (2011). Badano, J. L., Mitsuma, N., Beales, P. L., Katsanis, N. The ciliopathies: an emerging class of human genetic disorders. Annu Rev Genomics Hum Genet. 7, 125-148 (2006). Novarino, G., Akizu, N., Gleeson, J. G. Modeling human disease in humans: the ciliopathies. Cell. 147, 70-79 (2011). Brugmann, S. A., Cordero, D. R., Helms, J. A. Craniofacial ciliopathies: A new classification for craniofacial disorders. Am J Med Genet A. 152A, (12), 2995-3006 (2010). Valente, E. M., Rosti, R. O., Gibbs, E., Gleeson, J. G. Primary cilia in neurodevelopmental disorders. Nat Rev Neurol. 10, 27-36 (2014). Davenport, J. R., et al. Disruption of intraflagellar transport in adult mice leads to obesity and slow-onset cystic kidney disease. Curr Biol. 17, 1586-1594 (2007). Zaghloul, N. A., Katsanis, N. Mechanistic insights into Bardet-Biedl syndrome, a model ciliopathy. J Clin Invest. 119, 428-437 (2009). Einstein, E. B., et al. Somatostatin signaling in neuronal cilia is critical for object recognition memory. J Neurosci. 30, 4306-4314 (2010). Wang, Z., Phan, T., Storm, D. R. The type 3 adenylyl cyclase is required for novel object learning and extinction of contextual memory: role of cAMP signaling in primary cilia. J Neurosci. 31, 5557-5561 (2011). Berbari, N. F., et al. Hippocampal and cortical primary cilia are required for aversive memory in mice. PLoS One. 9, e106576 (2014). Han, Y. G., Alvarez-Buylla, A. Role of primary cilia in brain development and cancer. Curr Opin Neurobiol. 20, 58-67 (2010). Han, Y. G., et al. Dual and opposing roles of primary cilia in medulloblastoma development. Nat Med. 15, 1062-1065 (2009). Lim, D. A., Alvarez-Buylla, A. The Adult Ventricular-Subventricular Zone (V-SVZ) and Olfactory Bulb (OB) Neurogenesis. Cold Spring Harbor perspectives in biology. 8, (2016). Shimada, I. S., LeComte, M. D., Granger, J. C., Quinlan, N. J., Spees, J. L. Self-renewal and differentiation of reactive astrocyte-derived neural stem/progenitor cells isolated from the cortical peri-infarct area after stroke. J Neurosci. 32, 7926-7940 (2012). Mich, J. K., et al. Prospective identification of functionally distinct stem cells and neurosphere-initiating cells in adult mouse forebrain. eLife. 3, e02669 (2014). Mirzadeh, Z., Merkle, F. T., Soriano-Navarro, M., Garcia-Verdugo, J. M., Alvarez-Buylla, A. Neural stem cells confer unique pinwheel architecture to the ventricular surface in neurogenic regions of the adult brain. Cell stem cell. 3, 265-278 (2008). Pedersen, L. B., Mogensen, J. B., Christensen, S. T. Endocytic Control of Cellular Signaling at the Primary Cilium. Trends Biochem Sci. (2016). Christensen, S. T., Clement, C. A., Satir, P., Pedersen, L. B. Primary cilia and coordination of receptor tyrosine kinase (RTK) signalling. J Pathol. 226, 172-184 (2012). Clement, C. A., et al. TGF-beta signaling is associated with endocytosis at the pocket region of the primary cilium. Cell reports. 3, 1806-1814 (2013). Taverna, E., Gotz, M., Huttner, W. B. The cell biology of neurogenesis: toward an understanding of the development and evolution of the neocortex. Annu Rev Cell Dev Biol. 30, 465-502 (2014). Joiner, A. M., Green, W. W., McIntyre, J. C. Primary Cilia on Horizontal Basal Cells Regulate Regeneration of the Olfactory Epithelium. J Neurosci. 35, 13761-13772 (2015). Inaba, M., Buszczak, M., Yamashita, Y. M. Nanotubes mediate niche-stem-cell signalling in the Drosophila testis. Nature. 523, 329-332 (2015). Peng, T., et al. Hedgehog actively maintains adult lung quiescence and regulates repair and regeneration. Nature. 526, 578-582 (2015). Rauhauser, A. A., et al. Hedgehog signaling indirectly affects tubular cell survival after obstructive kidney injury. Am J Physiol: Renal Physiol. 309, F770-F778 (2015). Chavez, M., et al. Modulation of Ciliary Phosphoinositide Content Regulates Trafficking and Sonic Hedgehog Signaling Output. Dev Cell. 34, 338-350 (2015). Lobo, M. V., et al. Cellular characterization of epidermal growth factor-expanded free-floating neurospheres. J. Histochem. Cytochem. 51, 89-103 (2003). Pastrana, E., Silva-Vargas, V., Doetsch, F. Eyes wide open: a critical review of sphere-formation as an assay for stem cells. Cell stem cell. 8, 486-498 (2011). Nishino, J., Kim, I., Chada, K., Morrison, S. J. Hmga2 promotes neural stem cell self-renewal in young but not old mice by reducing p16Ink4a and p19Arf Expression. Cell. 135, 227-239 (2008). Shimada, I. S., Peterson, B. M., Spees, J. L. Isolation of locally derived stem/progenitor cells from the peri-infarct area that do not migrate from the lateral ventricle after cortical stroke. Stroke. 41, e552-e560 (2010). Mirzadeh, Z., Doetsch, F., Sawamoto, K., Wichterle, H., Alvarez-Buylla, A. The subventricular zone en-face: wholemount staining and ependymal flow. J Vis Exp. (2010). Coles-Takabe, B. L., et al. Don't look: growing clonal versus nonclonal neural stem cell colonies. Stem Cells. 26, 2938-2944 (2008). Pal, K., et al. Smoothened determines beta-arrestin-mediated removal of the G protein-coupled receptor Gpr161 from the primary cilium. J Cell Biol. 212, 861-875 (2016). Caspary, T., Larkins, C. E., Anderson, K. V. The graded response to Sonic Hedgehog depends on cilia architecture. Dev Cell. 12, 767-778 (2007). Bangs, F. K., Schrode, N., Hadjantonakis, A. K., Anderson, K. V. Lineage specificity of primary cilia in the mouse embryo. Nat Cell Biol. 17, 113-122 (2015). Berbari, N. F., Bishop, G. A., Askwith, C. C., Lewis, J. S., Mykytyn, K. Hippocampal neurons possess primary cilia in culture. J Neurosci Res. 85, 1095-1100 (2007). Paridaen, J. T., Wilsch-Brauninger, M., Huttner, W. B. Asymmetric inheritance of centrosome-associated primary cilium membrane directs ciliogenesis after cell division. Cell. 155, 333-344 (2013). Kiprilov, E. N., et al. Human embryonic stem cells in culture possess primary cilia with hedgehog signaling machinery. J Cell Biol. 180, 897-904 (2008). Mukhopadhyay, S., et al. TULP3 bridges the IFT-A complex and membrane phosphoinositides to promote trafficking of G protein-coupled receptors into primary cilia. Genes Dev. 24, 2180-2193 (2010). Ishikawa, H., Marshall, W. F. Efficient live fluorescence imaging of intraflagellar transport in mammalian primary cilia. Methods Cell Biol. 127, 189-201 (2015).